A young and naive officer was visiting an army barracks on the South Coast of England in the 1930's. He observed that the sentry at the gate handed a pair of thick rubber gloves to the next sentry when they changed the guard. The next sentry hung the rubber gloves in the sentry box and at the end of his "shift" took them out and handed them to the incoming sentry. The officer was intrigued and asked questions. The sentry could explain what he had to do, but he was reduced to gibbering when the officer tried to find out why they did this. The sergeant, when asked "Why? ", just repeated the manual which describe the procedure but didn't explain what the purpose was for. As far as the sergeant was concerned the only purpose for the rubber gloves was for the sentries to hand them on to each other! It took a lot of research in the history of the barracks to find out why. (I'll give the explanation in class). Moral1: Always document the reasons for an activity in a system. Do it when the activity is thought of, or do it 10 years later when you are forced to remove or change it. Moral2: Today's solution is tomorrow's confusion and the next day's problem. It is a good idea to have incoming EMail pop up as it arrives. This solves the problem: "I want to know when I have new Email". It is a natural solution. But in some cases it causes a problem. For example I saw a presentation at the IEEE/ACM Software Engineering conference ruined when the speaker's Email popped up in the middle of his slides. Now "Smart Phones" and "iPods" make sure the we always know when new mail arrives, at the cost of continuous distractions. A similar example starts with the problem that a fixed image on a cathode ray tube tends to damage it. So computers had special programs called "screen savers" that turn on and display a moving image when the the machine is idle. But, in the middle of a presentation, video, or when watching a news channel, a screen saver turning on is irritating. Again you can use the techniques below to model systems at two levels. You can include all the technological details. This gives you a physical model. You can also create abstract or essential models that will not change when the technology implementing them is changed. We have already the two most popular diagrams for Data Modeling -- DFDs and ERDs: [ a4.html ] and this section adds to these diagrams some text based ways of "documenting a system". Later we will get to some specialized and detailed techniques: [ r1.html ] (Rules and procedures), [ r2.html ] (Requirements), and [ r3.html ] (Specifications). when I put a glossary on the web. You also need to track aliases because the same idea is often referred to by different phrases in different parts of an organization. user_id::CSE="unique identifier of a user". CSE::CSUSB="Computer Science and Engineering Department". CSUSB::="California State University, San Bernardino". defined_term :: context = definition. Notice that I also define the contexts for each definition. Contexts start to analyze the structure of the organization. In Computer Science, in the mid-60's, we adopted the idea of listing definitions to define the syntax or grammar of computer languages. Jim Bachus and Pete Naur proposed the original Bachus-Naur-Form or BNF as a practical form of the theoretical "context free grammars" developed by Noam Chomsky. Since then just about every programming language has had its syntax defined by using EBNF (Extended BNF) that has ways to show repeated and optional patterns in the data. If you want you can look at [ EBNF ] on the Wikipedia for history, examples, and details. I have many examples -- see the [ Online Enrichment ] exercises at the end of this page. login::= user_id password, user supplies their id and password when they login. user_id::=char[1..8], between 1 to 8 characters, inclusive. password::=char[*], any number of characters. SSN::data_element=("0".."9")^9, unique identifier for USA residents. date::USA= month "/" day "/" year. date::UK=day "/" month "/" year. XBNF is defined as a computer language. As a result I have tools for handling it. If you go to [ ../hole.html ] you will find a web app that will convert XBNF into HTML. I generated a complete glossary [ glossary.html ] of all the materials for this course by extracting and sorting all the definitions on all the pages. You might like to look at it. A glossary can grow into a data dictionary if you add detailed information on all the processes, external entities, and data for the enterprise. This in turn becomes the information you must have to design new systems. Here for example is part of the data dictionary for a recent student project. See the online Enrichment at the bottom of this page to see the whole glossary/data dictionary. SSN data element 9 digits uniquely identifying humans in the USA. See [ Data_dictionary ] (the Wikipedia entry). Most of the data dictionaries on the market use a data base rather a set of simple files. They are typically part of a proprietary DBMS. Rather than promote a particular DBMS in this course I will describe data dictionaries in terms of tables. Each level is made up of the lower levels: a record has elements for example. I think the first use of the name was for a CDC product in the late 1970's. It is a place to record some important facts about existing and planned systems. It complements the various diagrams we draw by providing and organizing quantitative and textual information about a system. The only other place where this data is stored is in source code. However, you will find it distributed and duplicated in many different pieces of code. Indeed a significant source of bugs comes for incompatible assumptions made about the data by different pieces of software. You need to record information about existing systems so that you can create better systems. You also need to specify the data in your new systems so that the data base can be created and the software written to access it. Many media can hold data in an enterprise. You should gather samples, print outs, data base designs, spreadsheets, etc. You need to also record ideas and designs. Thus you need to record data about the data -- so-called metadata. metadata::jargon="data about data", for example the format of a date. A data dictionary describes the data in a system in great detail. The typical format is a data base with forms as an user interface. Some methodologists use the computer science technique of writing BNF (above) to describe data. Some data dictionaries include information on the processes in a system as well as the data stored and flowing through it. Data dictionaries are a good place to record physical details like the media and format of data and processes. This may change but you can then avoid putting this detail into the more abstract models: DFDs, Scenarios, ERDs, etc. Notice that you can use any number of different CASE and Systems Analysis tools to record this data. Visio, Rational Rose, and Dia can use the Unified Modeling language to create visual data dictionaries. Or you can use simple text files (memos or notes on a PDA) or 3><5 cards and a pencil. Posters are common. It is also easy to generate web pages that store the information -- and then you can link the different pieces of data together. 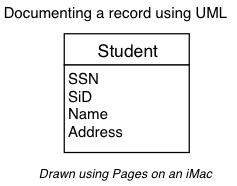 Data Elements -- gathered into record structures -- Example: an SSN. Record Structures -- describe data flows and stores -- Example: your record on SIS+. External Entities -- Sources and Sinks, linked to their data flows -- You! Processes -- Describe activities, linked to their data flows -- "Print rosters". Notice: all the data in the data dictionary is should be given a date when it was recorded... Ideally the data dictionary should keep a history of changes. Length 9 How many bytes needed? Syntax 999-99-9999 Layout of the data on input/output. Records ... Links to record structures where item appears. We will discuss the design of data elements later( [ d2.html ] ) in this course. A record is a collection of data elements that are always handled together. The idea goes back to the beginning of computer systems when a punched card was a record. The items or fields were pieces of the card. The idea moved onto all other data media and into COBOL. From COBOL to Algol68, Pascal, and C.
A record is a sequence of named fields -- just like a C/C++ struct or the data members in a C++/Java class. One way of documenting record structures is to draw an UML class diagram. These record structures also map closely into data base descriptions. To document a data flow you need to list the records that flow through it and (optionally) how the flow is (or will be)implemented. A data dictionary should link each data flow to its source and destination. Data stores should, ideally, store only a single type of record. You must identify the types of record in a data store. You should indicate if a subset of the items form a key. Each key value determines a unique record. You should note the sequence of the records -- or state that they are in random order. You need to note how many there are now and how fast this is growing. List of Record Structures -- in a normalized system there is only one record type per store. A set of inter-related data stores should be documented using an Entity-Relationship Diagram. Ultimately data stores are mapped into data base tables, which will be covered later in the class. Process descriptions can require special documentation of the detailed logic, see [ r1.html ] and [ r2.html ] for details. However initially you use the techniques in the next section. You can document a lot of the information in a data dictionary in the UML. You treat each record type as a class with attributes but no operations. This works OK for small projects when the diagram fits on a page. When it becomes poster sized you may need to go to more complex tools. To be more precise you specify the resources needed by the process and the results that it achieves. Given randomly ordered student records sort them by student I.D. Another approach is to write a Story describing what the process does. A story is a simple paragraph describing what we want the process to do. It is wise to record the goal of a process -- since this can get lost as the system develops. In many businesses part of the know-how is in the form of mathematical formulas. Many domains have standard calculations. Once you have a Process that can be expressed this way then it is a bad mistake to draw a DFD of it. Instead you need to define meaning of the process as a formula. Expressing formula in text is easily done by using expressions from a programming language. Or you can use the Equation Writer that is available with most word processors. There is a standard Computer Science language called ΤΕΧ (pronounce "teck) that is designed for writing mathematics. There have been experiments in using more complex logic and discrete math to describe the behavior of a system in abstract form and then execute the model to see if the ideas work. It is also possible to manipulate them to search out unwanted behaviors. These are a part of [ ../cs556/ ] Formal Methods. So they are not covered here. A scenario provides more details on a complex process. It is a numbered sequence of simple actions by subjects that achieves some stated goal. A scenario must mention who does each action (the subjects). To completely describe a complex process it easiest to write many simple scenarios. Each is a simple slice through the possibilities. To handle algorithms and complex decisions you need more complicated techniques mentioned below. A scenario can be used to describe any pattern of activity that you either (1) observe in the real world, (2) imagine as existing, or (3) plan to be part of your future system. A Scenario can be Physical (mentioning the technology) or Essential (abstracted from the technology). Essential Scenarios are Logical Models. Scenarios are easy to understand -- People get "scenarios". Both by users and technologists. They map simply into specifications and designs for programs. They are also a very good Modeling tool to use with non-computer people. Jo clicks the Red Cancel Link. Bear in mind that a significant number of users are not using a mouse and so can not "click" anything! Notice: a scenario has no branches, conditions, exceptions, extensions, or parallelism. It should be strictly sequential. You should also use simple language in scenarios and borrow from the stakeholder's words and phrases. A Scenario can not express all the things that happen in real systems. It is a slice of life, It shows one simple path through the possibilities. Real systems make decisions and follow different branches at different times. A single scenario can not describe all the possibilities. Neither can it handle parallelism -- when many things are happening and can happen in different orders. For example: three people are working on a common set of tasks -- stuffing, stamping, and sorting envelopes for example. There is no one scenario which describes all the possible sequences of events. To express more complex processes an activity diagram [ r1.html#Activity%20Diagrams ] can be used. I would make each "activity box" stand for a simple scenario. You can handle non-determinism of parallel system by drawing a Data Flow Diagram [ a4.html ] (Previously). Here's a scenario outlining a successful withdrawal attempt at an automated teller machine (ATM). John Smith presses the "Withdraw Funds" button. The ATM displays the preset withdrawal amounts ($20, $40, ...). John chooses the option to specify the amount of the withdrawal. The ATM displays an input field for the withdrawal amount. John indicates that he wishes to withdraw $50 dollars. The ATM displays a list of John's accounts: a checking and two savings accounts. John chooses his checking account. The ATM verifies that the amount may be withdrawn from his account. The ATM verifies that there is at least $50 available to be disbursed from the machine. The ATM debits John's account by $50. The ATM disburses $50 in cash. The ATM displays the "Do you wish to print a receipt" options. The ATM prints the receipt. Sally Jones places her bank card into the ATM. Sally successfully logs into the ATM using her personal identification number. Sally deposits her weekly paycheck of $350 into her savings account. Sally pays her phone bill of $75, her electric bill of $145, her cable bill of $55, and her water bill of $85 from her savings account. Sally attempts to withdraw $100 from her savings account for the weekend, but discovers that she has insufficient funds. Sally withdraws $40 and gets her card back. We will discuss use cases later in this course and study them in detail in CSCI375. "Never talk to a user without a prototype in your hand". An iteration is a high quality, usable subset of a project. It meets some of the requirements and is designed so that it is easy to add more requirements. Each iteration modifies the existing system. Each iteration is well made and documented but doesn't meet all requirements, yet. A prototype is often incomplete and nearly always of low quality. It is produced quickly using specialized tools. The result is not run quickly. It is not designed so that it can be easily reused in the project. There is a trap with trying to change a prototype into an iteration: it is harder to put quality into bad software than it is to add features to good software. It helps to study prototypes used outside the software field. The following all have analogies in software and systems development. A poster showing the successive screens/pages as a scenario is executed. The term comes form the movie industry where directors use them. You will often find images of story boards as "extras" on DVDs. These are not high-tech prototypes. Use a board and stick cards on it. Use story boards as a basis of planning and discussion. A mock up looks like the real thing and may even do some things but is not properly constructed. It's possible the term comes from publishers. A computer example is faking a web page to show its look-and-feel. Many automobile companies produce strange and wonderful one off cars in exhibitions to show what is possible. Most don't make it into production. Use concept cars to sell a new system to management? Once upon a time electronic engineers would try out ideas on the kitchen table and use a bread board and pins to hold the wires in place. To this day you can buy special electronic breadboards. Typically they become an untidy mess of wires with many inputs, meters, and probes attached to it. Used by software people to try out an algorithm -- full of extra outputs and with a user interface designed for techies. Don't let the user see these! A variation on breadboard prototyping is for complex systems which may have unexpected performance problems and timing hazards. Here the protoype is for a component. It provides all the necessary interfaces and even responds similarly to the real component... however it doesn't compute the results correctly. This is a recent proposal [ Montagne10 ] that needs thinking about. A scale model has all the functionality of the final system but does not have the full data base. It's purpose is to spot logic problems quickly and to test if the design will scale up. Give an example from your experience of a solution that has become a problem. Try to solve a problem. Describe and distinguish: glossary, BNF, and data dictionary. What is the purpose of a data dictionary. I have several dozen [ ../samples/ ] glossaries written in my own style -- XBNF. This is an expanded glossary [ dd01.html ] for a project carried out by one of my graduate students. DeMarco::person=inventor of a kind of DFD and data dictionary, [ Tom_DeMarco] .